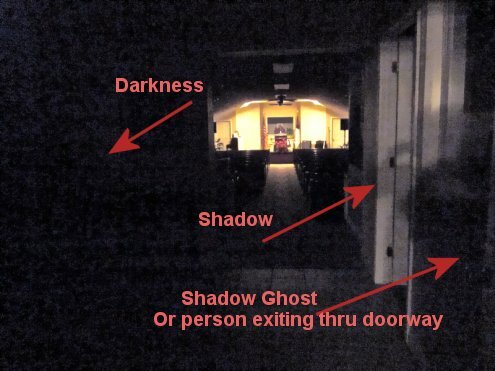 i took this picture while investigating a local church, what are your thoughts ? Looks like a shadow on the right side... Is there something in particular that we are supposed to be looking at? the shadow on the right is the focus of the pic, its grainy because i had to adjust the lighting and contrast.where the shadow is stands a wall so it would have to be partialy through the wall. Interests:Paranormal investigation (obviously), movies, baseball, hockey, and I do manage to steal some time to read. You can tell the edge of it is transparent because you can see the wall through it, and that part doesn't seem to be the shadow of the photographer. Pretty interesting capture, but too grainy and dark to say for sure what it is. Looks like the shadow of the photographer... arm bent and holding the camera up to take the photo. But, there is still enough there to make me go hmmm. I have no idea what it is, though. Edited by DarkShadow, 29 May 2013 - 07:08 AM. I see a possible shadow, and some kind of blur on the right side. Not enough data to make more than a guess. It's to bad that the photo was so dark... and then trying to brighten it helped but it's still not clear enough to make a fair analysis. But from what I see, it seems to be a human figure either living or dead. I don't know what is meant by it being a shadow, because this figure seems to have substance. 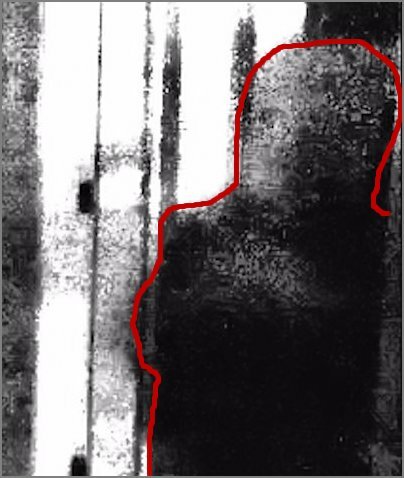 This "figure" has no human features ... no arms or legs ... a rectangular streak with no facial features for a head ... and it's shape is composed of the exact same dark, grainy, featureless blackness that composes every other area in the image that is not well lighted. I don't understand why anyone would consider it to be a figure and not just more dark shadows. I still suggest it being a living person entering or exiting through a doorway... or a 'shadow being' making an appearance. Some shadow figures have rather distinct features and some do not. The three I have personally seen with my own eyes, did not. First of all, the figure (in my estimation) DOES have a shape that resembles a human form with possibly a long dark coat. And his head is a lighter color. And on our left of the figure, there seems to be a sleeve coming down with possibly a hand beyond that. At least it gives that appearance (see the third photo below), There does however, appear to be a shadow in the doorway behind the figure but I'm not counting the figure in front (the one in question) as a shadow. 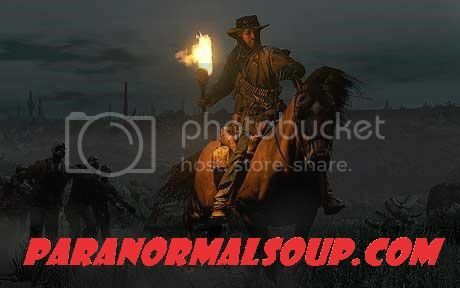 So because the picture turned out so dark (no flash), everything will appear dark and grainy after the submitter severely lightened the photo. There's no way around that. 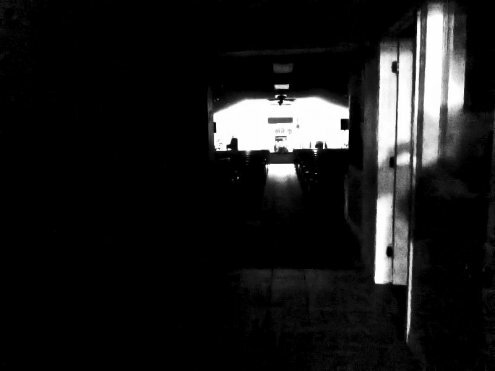 But the part of the figure exiting the dark room thru the side doorway, still remains brighter (it's head), meaning it's not a shadow. In other words, as it goes into the dark room, the head remains brighter. I could go on but I'm really not looking for a debate... so this is how I will hopefully end my comments concerning this photo. This is all conjecture on my part of course... but I do have some experience in dealing with photos. I guess it's now up to the viewers to decide. I did write this fast and with a lot of distractions, so pardon my French... ah, I mean my Grammar! Well I'm almost certain it's someone or something <suspense music>, trying to get out of the way. In the clear shot (last posted) it does seem that someone tried to get out of the shot. Many people don't realize it, but "no one was there when I took this picture" really means "I didn't see anyone when I took this picture." Take almost any random picture, especially in places where tourists gather, and you'll likely get a figure in the photo you didn't see when you shot the image. Someone was in this church and when the poster took the picture, scrambled to move but the lens clicked first. Agreed - A person trying to get out of the way. Beings how dark it was and no flash, a person would certainly look that way in the picture. So I guess the consensus would make it a living person then. But I won't completely rule out a dark hairy ape with a bag of popcorn!